If it is true that the missile “went awry” just 500 meters or so into its boost phase, that would represent a fairly significant failure. The Agni-II’s range is thought to be in the range of 2,000 to 3,000 kilometers, putting it at the higher end of what the United States Department of Defense would classify as a medium-range ballistic missile. It is a two-stage system that uses solid propellant. India’s Agni-II inventory has seen iterative improvements over the years, focusing mostly on improving the system’s guidance and accuracy. A user-trial failure at a later phase in the flight would suggest perhaps some sort of guidance failure. A failure early in the missile’s boost phase could also suggest that the particular unit chosen for testing suffered from cracks or gaps in the solid propellant grain, which would allow for a build-up of pressure upon ignition and, ultimately, failure. Scanning for these sorts of deficiencies requires equipment, including industrial x-ray scanners, that India only recently developed indigenously after being unable to import scanners from abroad. Various conditions — ranging from sharp temperature changes to stress in transportation — could have affected the propellant grain of this Agni-II, which could have been in storage for more than a decade. It’s worth recalling that the Agni-II has seen failures before, though in developmental testing, and some critics have noted that the missile was inducted into India’s nuclear forces after insufficient testing. A failed nighttime test of the system in 2009 saw its successful boost, ascent, and separation of the second stage, with the failure ultimately coming down to guidance. Given the system’s age, however, if the problem that caused the latest test comes down to poor propellant casting early on in India’s missile development, New Delhi will no doubt be looking to discover what portion of its existing solid fuel missiles may suffer from similar issues. Ultimately, this latest failure could have come down to a fluke, but that’s likely not an assumption India’s Strategic Forces Command will adopt willingly. Even if the remainder of India’s stockpile may stand in good stead, the SFC will be looking for assurance that these missiles can perform when needed. The public perception of the failed test will also be worth watching; a successive failure could raise wider concern about the health of India’s strategic deterrent. One need only look at the United Kingdom’s public debate surrounding a Trident II D5 test failure for a reminder of how things can spiral. It turns out that aggregate failure rates for the Trident over decades remain within acceptable ranges. 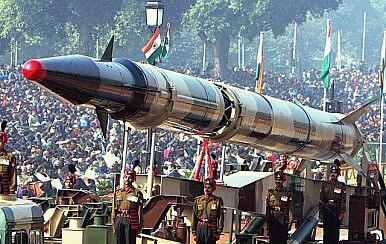 Given the comparatively younger lifespan of the Agni-II, India will no doubt be looking to get to the bottom of this matter. Pakistan underlined the Nasr's capability to stress ballistic missile defense systems in the region.